Every girl loves to have flawless skin and some prefer to do it without having to have to use lots of foundation to cover up! Is that possible you make think and the answer is yes. This will not work for everyone as everyone is of a different skin type nevertheless if you like to have a little coverage and foundation is too much for you continue to read this post ! 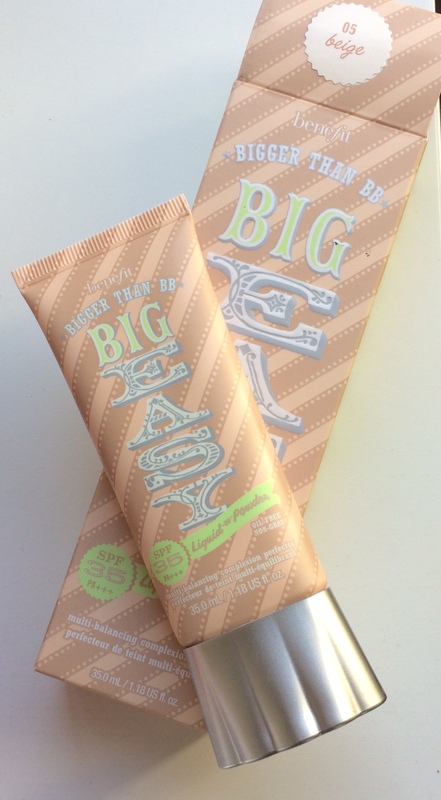 Benefit’s Bigger than BB Big Easy SPF 35 is one you should consider to go to. It is a BB cream so it isn’t a foundation nevertheless it is similar to a tinted cream with sun protection. It is extremely soft when you apply it on your skin and the colour matches perfectly. It gives you a flawless look but you can’t even feel it! I personally have combination skin and it helps prevent oil and moistures at the same time! It comes in 35.0mL/1.17 US fl.oz. and six shades nevertheless the colour naturally blends with your skin colour which indeed it did! They also sell them in sample sizes if you like to try it. This is the link to the UK store, unfortunately it doesn’t seem like Benefit does international shipping only if you live in the United Kingdom, United States, France, Germany and China. So you might want to check in your local beauty store if you do not live in one of those places!